Quality materials and design translate into a durable, stable, and attractive work surface for junior artists that will last for years. Tot Mate stain-resistant laminate surfaces make cleanup easy. The wide positioning of the legs creates a very stable base. Levelers on each leg base adjust by hand with no tools. These tables feature premium 1" thick laminate tops in Pearl color trimmed with your choice of Tulip Red or Royal Blue edging. Assembly is required. 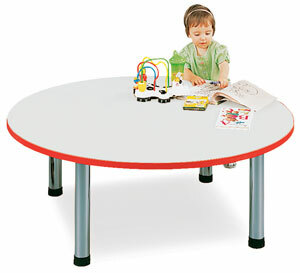 Large Rectangular Play Table — This table will seat up to eight youngsters. 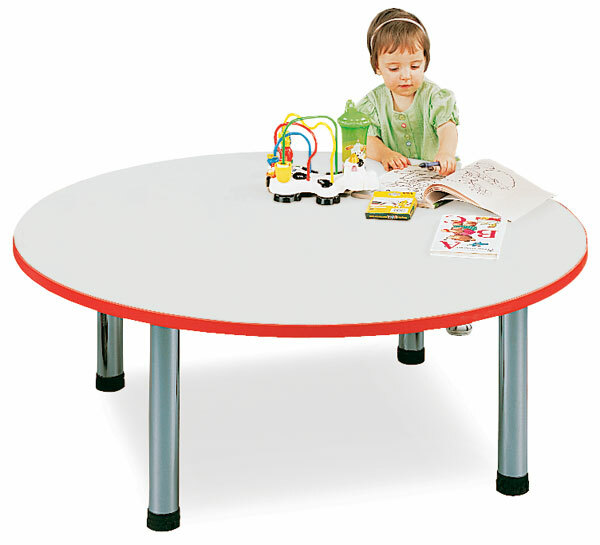 It measures 30" D × 60" W.
Circular Play Table — This table will seat up to eight youngsters. The table measures 48" in diameter. Small Rectangular Play Table — This table will seat up to six youngsters. It measures 24" D × 48" W.
™ Tot Mate is a trademark.™ Tot Mate is a trademark.